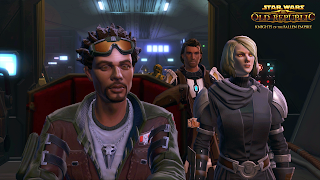 In Star Wars: The Old Republic – Knights of the Fallen Empire, you will become the Outlander, a veteran of the Great Galactic War, travelling to the outer rim of the galaxy. There you will come face-to-face with a new threat, Emperor Valkorion and his Eternal Empire, only to discover that his dark destiny is tied to your own. You will lead the fight to save the galaxy but it is clear from your first encounter with the Eternal Empire that you will need help; you must recruit a powerful team of Companions – and build an Alliance. Star Wars: The Old Republic – Knights of the Fallen Empire is available for Early Access for Subscribers who were active between July and early October. The digital expansion will launch on October 27, 2015 and is free for all Subscribers. To learn more visit http://StarWarsTheOldRepublic.com/fallen-empire/.